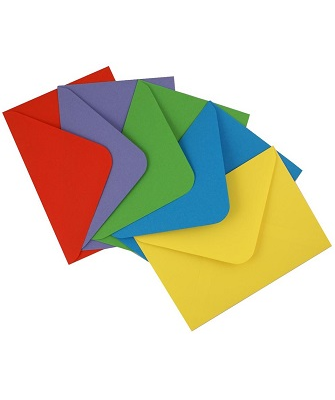 We offer a range of specialty envelopes in a variety of shapes, sizes, styles and colours. So whether you need an envelope for a greeting card, a reply, an invitation, an announcement or just a special event we believe we have the right envelope for your occasion. Prices are shown per envelope. You may order a minimum of 100 envelopes with additional quantities in multiples of 25 (unless otherwise stated). A discount applies for 500 - 975 envelopes and a further discount for 1,000 plus envelopes. For quantities in excess of 5,000 please contact us for a quotation. Tip: Don't fall for the old 'make my invitations now and find an envelope to fit later' trick. Envelopes come in standard sizes so you need to find the envelope first and make your invitations to fit; otherwise you may be looking at an 'expensive' custom made envelope making! Don't forget to make the invite a bit smaller than the envelope (at least 5 mm all sides) so that it slides easily in and out. Allow extra if the invite is bulky as the thickness will take up some of the width.